Iceland is the second largest island in Europe, following Great Britain, and the 18th largest island in the world. The island itself stretches across 103,000 km2 (40,000 square miles), which is about the same size as Hungary and Portugal, or Kentucky and Virginia. In its widest parts Iceland measures 500 km (305 miles) east to west and 300 km (185 miles) north to south. 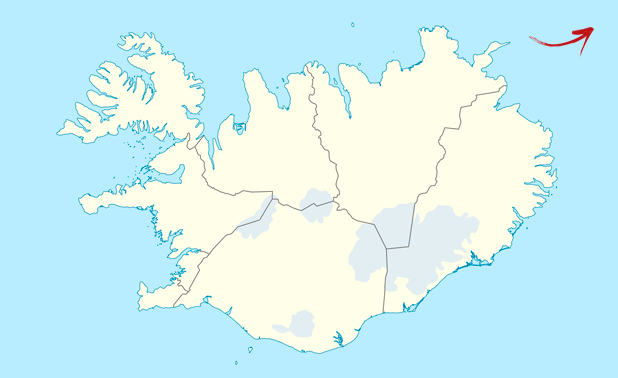 The coastline is 4,970 km, and Iceland maintains a 200 nautical-miles exclusive economic zone. It is possible to drive right around the island on the lovely coastal route on a 10-day holiday. With almost 80% of the country uninhabited, much of Iceland’s terrain consists of plateaux, mountain peaks, and fertile lowlands. There are many long, deep fjords and glaciers, including Europe’s largest, Vatnajökull. The landscape is characterized by waterfalls, geysers, volcanoes, black sand beaches, and otherworldly steaming lava fields. Iceland’s highest peak is Hvannadalshnjúkur, standing 2,119 m (6,852 ft) over sea level. More than 11 percent of the country is covered by glaciers. Its landmass comprises glaciers (12,000 km2), lava (11,000 km2), sand (4,000 km2), water (3,000 km2), and pasture (1,000 km2). Formed about 25 million years ago, Iceland is one of the youngest landmasses on the planet, and consequently home to some of the world’s most active volcanoes. The island ows its existence to a volcanic hotspot created by a fissure in the Mid-Atlantic Ridge, where the Eurasian and American tectonic plates meet. The landmass is still growing by about 5 cm per year, as it splits wider at the points where the two tectonic plates meet. The last volcanoes to erupt were Eyjafjallajökull in 2010 and Grímsvötn in 2011. Iceland even has the world’s newest island, Surtsey, formed in a volcanic eruption in 1963. Previous PostHEKLA IS READY TO BLOW!